(For his nephew, known as Henry Seymour-Conway until 1794,, see Lord Henry Seymour (politician).) Field Marshal Henry Seymour Conway (1721 – 9 July 1795) was a British general and statesman. A brother of the 1st Marquess of Hertford, and cousin of Horace Walpole, he began his military career in the War of the Austrian Succession. He held various political offices including Chief Secretary for Ireland, Secretary of State for the Southern Department, Leader of the House of Commons and Secretary of State for the Northern Department. He eventually rose to the position of Commander-in-Chief of the Forces. 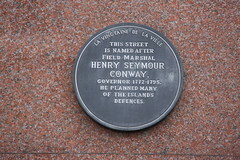 This street is named after Field Marshal Henry Seymour Conway, governor 1772-1795. He planned many of the Islands defences.